I'm experiencing problems on macOS Mojave 10.14.2 with an Exchange Mailbox in Apple Mail. The Exchange Mailbox account only updates once I click Mailbox > Rebuild. According to the Connection Doctor (Window > Connection Doctor), all connections work properly. Outgoing mail also works. With the same setup on my iPhone 6, iOS 12.1.13, there are no issues and the inbox updates promptly. The issue seems to be related to the Apple Mail on my Desktop computer, and to Exchange accounts only. My Gmail (IMAP) account in Apple Mail works as expected. How can I troubleshoot the issue, when one of several mailboxes won’t show new mails? As MS Exchange keeps all of your data on the server there is absolutely no reason why you shouldn't just remove that account. Delete any leftover mailboxes from mail.app and then re-add the Exchange account. I find that often fixes issues between mail.app and Exchange. 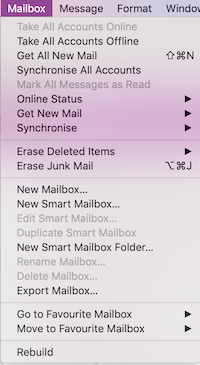 As an aside I stopped using mail.app for exchange connectivity (for work) for reasons that there are times when mail.app, Calendar, contacts, reminders, etc. just don't behave as expected when connecting to an Exchange server. Microsoft's (free, last I checked) Outlook client is actually an excellent mail client and I have never had a problem with Outlook on the Mac or on my iPhone. Not the answer you're looking for? Browse other questions tagged mail.app email mojave exchange . How to fix when Apple Mail fails to display new Exchange Imap e-mail messages?